Last October my friend Charlie and I visited Detroit. Well, technically we were in Troy, about 20 minutes north of the Motor City, and it was in Troy that our Michigander friends took us to Camp Ticonderoga, a massive restaurant designed to represent the best of the atmosphere of the Adirondacks, while serving top-class steaks, ribs, and all things meaty and American. It was here that I discovered the best name for a dish ever – Buffaloaf. 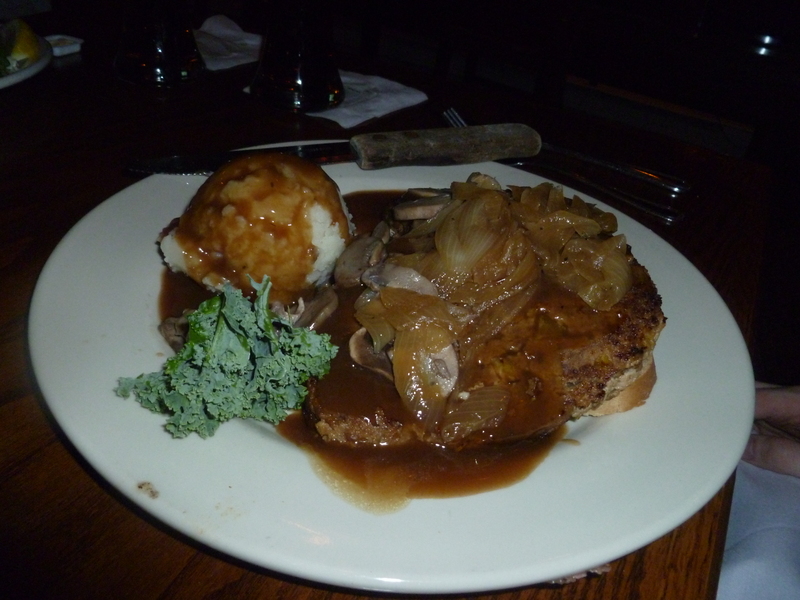 Buffalo meatloaf (pictured above) is something that I had never had the opportunity to try before – buffalo is really rather difficult to come across in the UK, what with there not being any buffalo and all. This meant that by the Law of Unrelenting Possessiveness I simply had to have it. I adore meatloaf (I still maintain my Dad makes the best), and this was superb. There is a subtle difference between the buffalo and beef which was detectable under the onion gravy. So many onions makes Chris a happy boy. I need to try more buffalo, and other meats which we simply don’t get over here, like Elk. Camp Ticonderoga is probably one of the best places to try – the place was packed, and the atmosphere was wonderful. It’s a really expansive restaurant, that feels like an old hunting lodge, just with added ESPN all over the place. Shame it’s a seven-hour flight away, or else I’d probably eat there every week! You can check out Ticonderoga’s website here, and check out their wonderful menu as well. Try these the next time your in Yorkshire. I buy the buffalo burger from their van at Harrogate farmers market. Only £2.00. Their fantastic. Highly recommended. There’s always a big queue! Thanks, I’ll definitely try them!